Do you collect glass insulators? I often see them for sale in antique shops and there are several web sites with information for insulator collectors. I’ve always found them attractive looking and I thought they’d be even more interesting if made into something functional. Flameless votive candles are a lot of fun (and safe) to incorporate into your decor. In this project I’ll show you how to make a glass insulator into a flameless candle lantern. “Hazelgreen, MO: Route 66 enthusiasts from all over the world will gather at 3:00 p.m. at the west end of the Gasconade River Bridge near Hazelgreen, MO on Saturday, March 14 to voice their support for a Missouri Route 66 and Ozarks icon, that being the bridge across the Gasconade River in Laclede County, Missouri. This ever-growing group of organizations and concerned individuals has worked tirelessly to save this bridge, including, at this point, seeking to have the bridge placed on the National Register of Historic Places. Over 200 people are expected to attend the rally. Having recently received notification that the bridge is indeed eligible for inclusion in the National Register of Historic Places, the Lebanon-Laclede County Route 66 Society (LL66), a 501(c)3 nonprofit, has come forward as this group’s supporting organization moving forward. Following the 3:00 p.m. rally, attendees will meet with other activists, historic preservationists, members of the Route 66 Association of Missouri, Laclede County Government Officials and officials from the state to discuss the Gasconade River Bridge and what can be done to save this historic structure. This meeting will be held at 5:00 p.m. at the Lebanon-Laclede County Library, located at 915 S. Jefferson St. Everyone with questions, specific interests, or desired involvement in the bridge is welcome to attend. The intent of the meeting is to discuss plans of action, forming of a committee, and discussion of any developments or findings since the last rally in December 2014. Despite the fact that it was relatively short-lived as a highway, US Highway 66 (Route 66) is, without a doubt, the most famous road in America. It is important in the history of US transportation as the first national highway linking Chicago and Los Angeles, but its significance in American history is much more far-reaching. Route 66 is symbolic of the major changes in American life during the first half of the 20th Century. These changes included the proliferation of automobiles, the development of roadside culture, and the westward migration of Americans during the depression and post-war years. However, more than anything else, Route 66, the Main Street of America, the Mother Road, has become an icon of progress, hope, opportunity and adventure in America. One of the reasons Route 66 is such a strong visual and physical experience is because of the way it was designed and engineered. Unlike new interstate highways, which are more efficient and meant to handle thousands of cars at high speeds, Route 66 has a more human scale, and as a result, people feel more physically connected to it. It is narrower, tends to have grassy shoulders (which means less pavement) and motorists can drive it more slowly without slowing the flow of traffic. As a result, the landscape unfolds instead of whisks past. Scenic Byway Routes like Missouri Route 66 have value not only for aesthetics and preservation, but also as a way to promote desirable forms of tourism and increase income in regions. Foreign and domestic tourists alike are interested in visiting the various points of interest, and the natural wonders of the physical and cultural environment offered along the Missouri Route 66 Corridor. Economic development opportunities in the Laclede County Route 66 Corridor are greatly based on corridor travel experience, as well as land uses and infill opportunities in the various communities. Intact bridges may be contributing features of large historic landscapes, or may be considered as individual resources. Intact bridges and individual sections of roadway may be representative of early engineering, workmanship and changes in road-building techniques during the period of significance, and of common patterns of use. These resources are important as tangible links with specific events and emerging technologies, such as completion of the first stretch of 4-lane highway Route 66 in Missouri, as well as for their overall role in the development of the highway system. The presence of intact historic roadways and bridges can also serve to strengthen connections between other types of resources, such as landscapes and groups of buildings. The Gasconade River Bridge is significant because of its actual experience of the road, the kinesthetic experience that is dependent upon a sense of place created by intact landscapes as a contributing property along Route 66. The Gasconade River Bridge has the ability to evoke a sense of place and experience. This historic structure, dating to 1924, is fully intact and reflects its period of significance, making it a perfect candidate for the National Register of Historic Places. The goal of this group of concerned citizens, passionate Route 66 enthusiasts/preservationists is to ensure the restoration and preservation of this historic Route 66 Bridge. Tens of thousands of tourists, mostly traveling abroad from other continents, descend upon the Mother Road ANNUALLY to live and experience the past. To these tourists, it’s the dream of a lifetime. Replacing the bridge with a modern structure would alter the canvas of Route 66 through the Ozarks, consequently interrupting that dream. According to a Rutgers University study released in 2012, more than 5 million people live and work along Route 66, more than 85% of Route 66 tourists visit historic places and spend over $38 million a year in Route 66 communities! Route 66 tourism boasts annual gains of $262 million in overall output. Our historic landmarks and pieces of infrastructure such as the Gasconade River Bridge should be kept available for tourists to experience. Publicity is the most instrument force we can ask for. We want to make sure our community is seen and heard. Missouri’s historic infrastructure is important, and right now it’s in the most critical condition. Our leaders need to recognize the need for maintenance and preservation of our aging highway system. While we still have these historical structures around, it’s imperative we preserve them for the sake of our growing communities. It’s not just a bridge, it’s not just a road, it’s a landmark. People tell stories about it, pay thousands of dollars, fly thousands of miles to see it, and they marvel over it. What will we leave behind for our children? Help us fix our historic structures. Help us get the attention of Jefferson City and Washington DC. We look forward to seeing you at the rally! 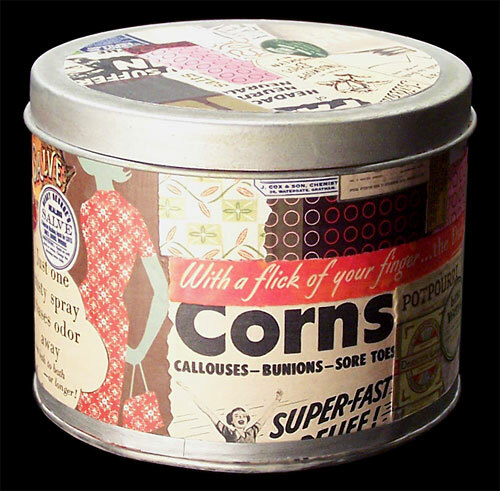 A lot of gifts and products come in decorative metal tins. Usually I don’t like the design already on the tin and prefer to cover it with something else. 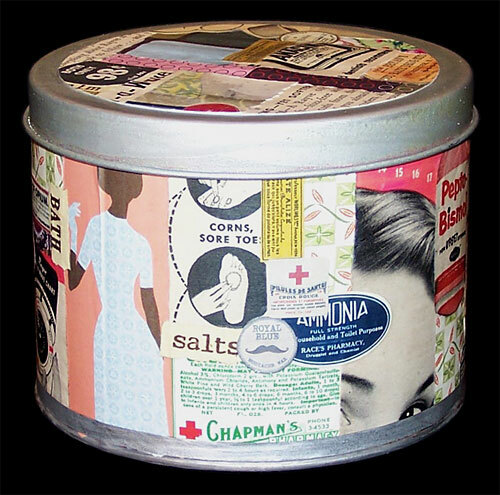 Turn a humdrum tin into a treasure with decoupage! To begin, gather together paper pieces with imagery that you like. This project will work best if they are on thin, opaque paper (not tissue paper). For my sample I wanted to create decorative tins for the bath, so I collected nostalgic images with a bath and personal products theme. Some of my images were downloaded from the Internet and printed for me at an office supply store. Some were cut out of magazines and catalogs, some vintage, some newer. Others were purchased from craft suppliers.You can also stamp images onto paper with permanent ink, such as the StazOn Timber Brown I used in this project. 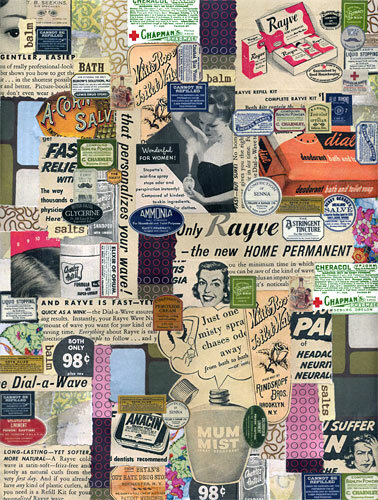 I stamped words from the rubber stamp set “Products on the Kitchen and Bath” onto narrow strips of torn scrap paper. Use any color of stamping ink you like as long as it is waterproof. Trim the images and cut to the size you want to use. Some images will look better cut out cleanly, some look good torn by using your metal ruler as a straight edge. You can also cut some with decorative paper edging scissors for variety. This project looks best if you prepare images in a variety of sizes. If you have any pieces larger than 1 inch square, there is a risk of the paper wrinkling as you apply it. Here is how to prevent wrinkling. Put down some scrap paper to protect your work surface. Pour a little matte medium into one of the paint wells. Paint the larger paper pieces on one side. Let dry, then flip over and paint the other side and let dry. Now they are ready to apply, wrinkle free! 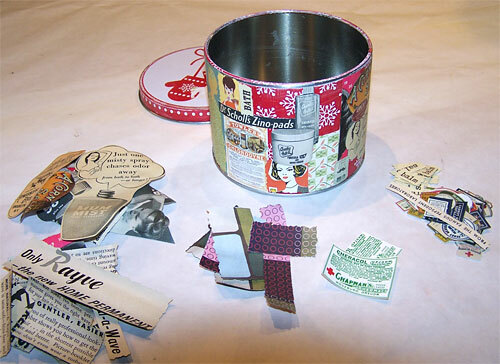 Prepare the tin to accept the paper – Sand the tin to rough up the painted surface to better accept the glued on pieces. Wipe of the dust with a damp rag. Let it dry. Now for the fun part, applying the paper pieces! For now, set aside the lid and only work on the body of the tin. Squeeze out some Aleen’s Turbo Tacky Glue into one of the paint wells. Start with larger paper pieces first – brush some tacky glue onto the back of each, then smooth in place on the body of the tin with your fingers (we’ll be using a different technique for the lid so set the lid aside for now). If you have to, roll the handle of your brush over the paper after you apply it or burnish with the edge of an old credit card to force any excess glue out and make the paper bond tightly to the tin with no gaps. You don’t have to worry about wiping or brushing away any excess glue if you don’t have big globs of glue oozing out – it will dry clear. Repeat this process until the whole bottom portion of the tin is covered. Let dry, then coat with a varnish of matt medium. Now we’ll work on the lid and a silver ribbon to wrap around the bottom edge of the tin. Sponge silver StazOn ink or other paint or ink of your choice around the edge of the lid and about a half inch onto the top. Cut two pieces of silver ribbon that are long enough to go around a tin one time. Tape them to a piece of scrap paper and sponge them with the silver ink or paint too – even though the ribbon is already silver it’s best to match it to the ink. Once the silver ribbon is dry, glue it around bottom edge of the tin with Tacky Glue. When the silver paint on the lid is dry, varnish lid and body of the tin with matte varnish. Get a piece of cardstock and decoupage it all over with more pieces of decorative paper. Let dry and coat with matte varnish. 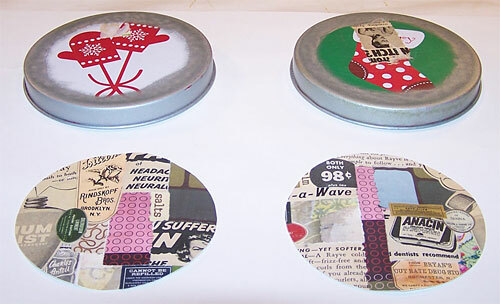 When the cardstock is dry, cut out a circle that is big enough to cover any unpainted areas of the lid. Glue down this paper circle with Tacky Glue, and let dry with a weight on top to keep it flat. You’re done!